Can You Name a Symptom of Ovarian Cancer? Put your knowledge to the test with a quiz at the Cancer Australia YouTube channel. 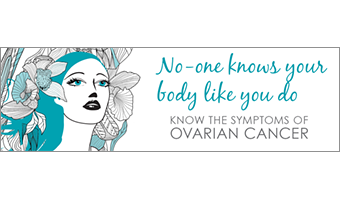 Marking Ovarian Cancer Awareness Month this February, Cancer Australia has launched a new online resource “No one knows your body like you do” to raise awareness and help women identify the symptoms of ovarian cancer. Through Cancer Australia, the Commonwealth Government is committed to reducing the burden of cancer on the community. National funding for ovarian cancer research projects and research programmes has increased five-fold in the last decade. Cancer Australia has also funded nine grants for organisations to support women with gynaecological cancers in urban and regional Australia; for example, through telephone support, support for Aboriginal and Torres Strait Islander women, as well as support and wellbeing networks. The Maintaining support for women with gynaecological cancers programme also aims to support health professionals to deliver evidence-based, multidisciplinary care to women affected by gynaecological cancers and provide information and support to them, their families and carers. Share the new awareness campaign at Cancer Australia’s: Twitter or Facebook. And for more information about gynaecological cancers, including ovarian cancer, visit the Cancer Australia website.